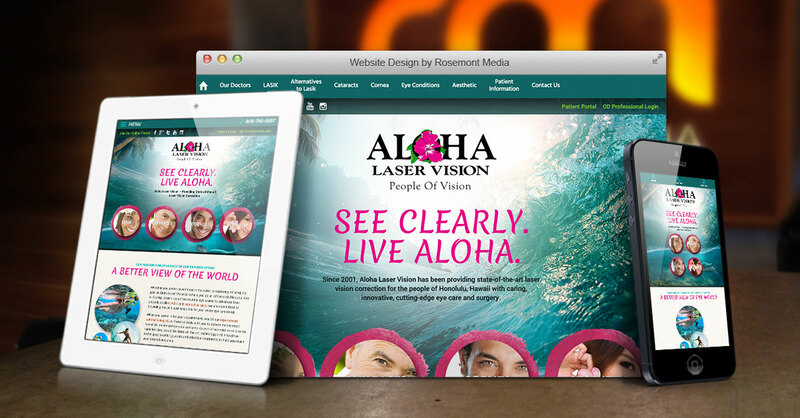 Aloha Laser Vision joined forces with Rosemont Media to develop a more contemporary website that incorporates all of the latest advancements in web design and functionality. Ultimately, the Honolulu eye surgeons chose to create a customized website package that exactly suited their requirements and the needs of their patients by combining medical SEO, responsive design, custom content development, intuitive navigation, a patient portal, questionnaires, a blog and a news room into a distinctive, modern design that reflects Hawaiian culture and the vividly-colored local landscape. The homepage features unique design effects which transition an indistinguishable blur of colors, into a crystal-clear seascape scene, accurately portraying the life-changing benefit of vision correction. Once the scene becomes fully realized, the page elements emerge into view, inviting the visitor to begin browsing. The new website for Aloha Laser Vision is first and foremost a comprehensive resource and communication tool designed to help expand the visibility, authority, and accessibility of the practice on the web. To see an example of the type of website design Rosemont Media can create for you and your eye care practice, please visit www.alohalaservision.com.